It’s actually English brown oak! Long-time readers of this blog (and it’s defunct predecessor) may recall that I bought a car-full (literally!) 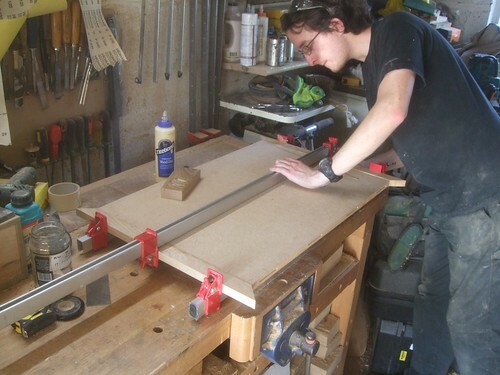 of this glorious native timber back in 2008, as I was preparing to make a drop-leaf table with cabriole legs in my second year of college. I also made a small step stool and I’m sure there were other uses but, even today, nearly four-years on; it’s fair to say that I still have usable lengths and dimensions of this stuff hanging around in my workshop! I’ll simply add that I find it easier to glue them on one pair at a time (in this case, end lippings first). 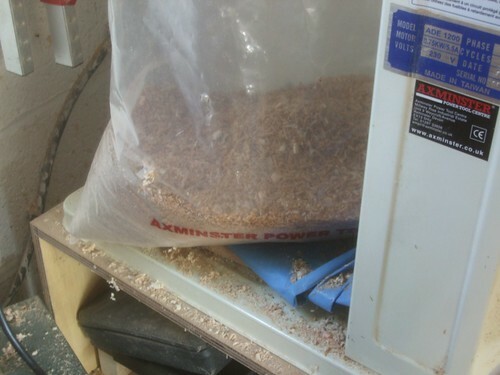 Also, you may have spotted my bobbin sander (covered with a pair of gloves and spanners!) at the end of my workshop. I’ve moved some of my power tool cases and things up in to the roof space. There’s a slim risk of damage from the leaking roof but, I still don’t know why I didn’t do this so long ago! One of these mitres went together almost perfectly. I don’t worry about it too much when I’m doing a workshop project like this. 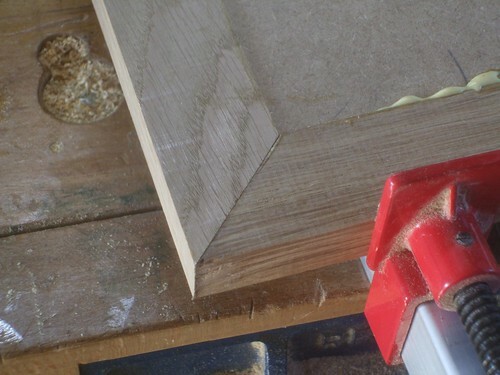 If my mitre saw’s slightly off of 45° then, I’m happy to squeeze a bit glue in to any slight gaps! Considering that I cut three of these edges with my circular saw though, I’m quite satisfied. 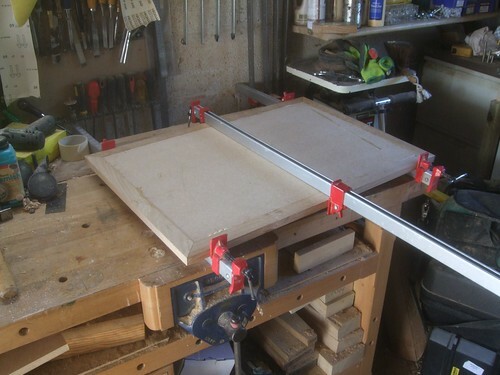 While that was drying, I got my Pocket Screw Jig out again and set about assembling the frame (or skirt) that’ll be fixed beneath the top and will allow it to be fixed to the main carcase, while also helping to keep the top flat (it will probably make more sense once you’ve seen it finished). 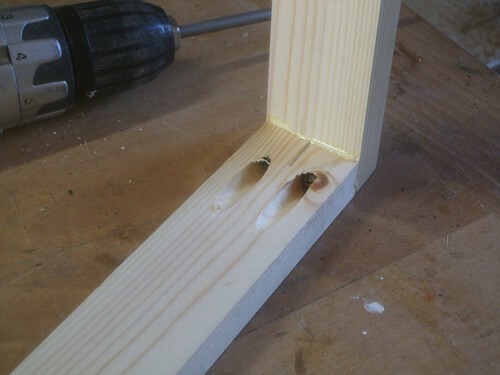 I was impressed that I could drive two screws in to such a narrow strip of timber (44mm – sawn from some 4x2in offcuts I had) without splitting! After rediscovering my 90° corner clamp [finally, a use for it, after all these years!!! ], assembling each joint was dead simple. My only problem was that the clamp partially covers one of each the two holes, meaning you can’t drive the screw it while it’s fixed to that side (does that make sense). It shouldn’t be an issue in larger jobs. 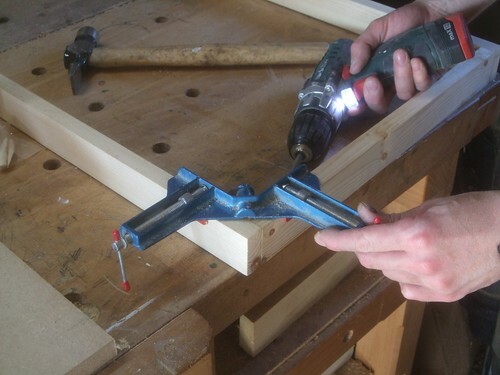 If I had two of those clamps, I may have been better off using one single screw in the centre.